It has been a long time since a book has held me captive, curled and cuddled beneath my covers until its pages were through with my mind. 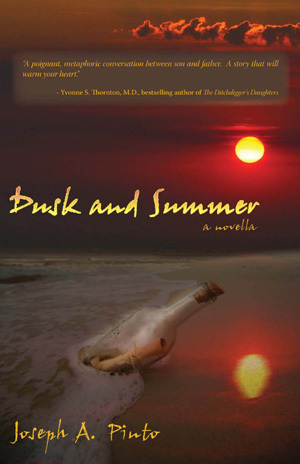 Dusk and Summer by Joesph A. Pinto kept me prisoner this afternoon while I hungrily devoured every last sentence down to the final period. The novella published by Pinto in 2008 is a deeply personal metaphysical journey that we are guests on. The beginning of the novella brought out the English teacher in me; I wanted to make some corrections. It seemed to me like he was using to many words when fewer would have allowed the tale to flow more evenly. The rocky beginning may turn off some readers with grammar Nazi tendencies, but true lovers of written word need to continue on. After all, didn’t E.E. Cummings used grammar flexibly to make a point, to draw us in and search for his meanings. Perfect grammar does not make a good story, it can help, but there still needs to be the essential magic that a true storyteller brings. Slowly, as I continued on through the pages the story took hold of me and I forgot all about my desire to edit and became the reader captivated. If you are tempted in novels to skip the foreward and go straight to the meat of the book; don’t. You will miss some much needed information about the author and how this book was birthed as well as the love behind it. All books in one form or another are born of an author’s heart. This one came from a love grown and nurtured over decades between a father and a son. It is also about letting go and following the wishes of a love one. There is a villain, one that I have had personal experience with, cancer. It claws and rakes families with misery. Some survive, and others goes through what the Pinto family did. They sit day after day with their love ones doing everything they can to make it though the next day, hour or minute with their sanity in tacked. Hoping and praying for miracles that never come. Searching for meaning. This is a book about one man’s search for meaning; about a son looking for a way to fulfill his father’s last wish and finding strength in his father’s life and death. It also continues the fight against the villain by contributing a portion of the proceeds to the Lustgarten Foundation for Pancreatic Cancer Research.